Jaipur Elephant Festival: What's Happened to It? Rajasthan isn't just all about camels and camel festivals! The Jaipur Elephant Festival was a great opportunity to see the sturdy symbol of Rajput royalty, the elephant, at its finest. The festival got underway with a traditional procession of decorated elephants. They proudly paraded up and down, like catwalk models, to an appreciative crowd. Elephant beauty contests, folk dances, and a tug-of-war between elephants, locals, and foreigners were all regular events. 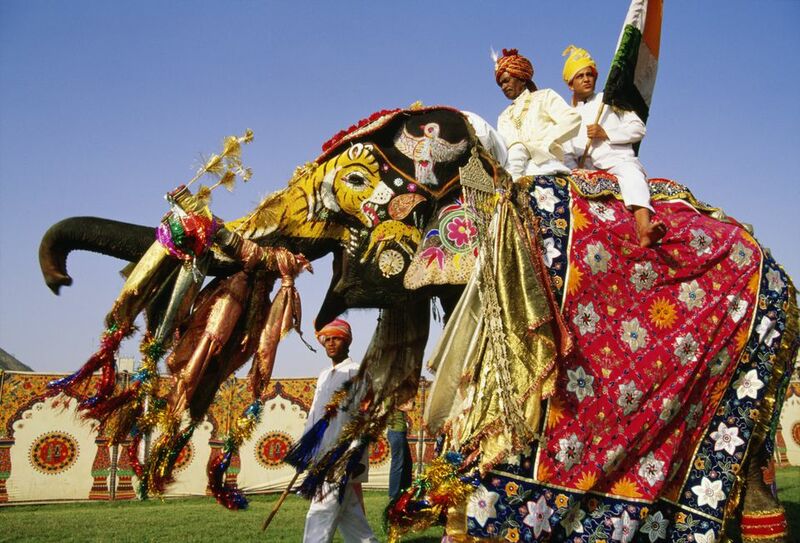 The Jaipur Elephant Festival used to take place annually on Holi eve. However, due to pressure from animal rights groups, it has not been held since 2012. The activists were concerned about the elephants being covered in toxic colored powder. They also contended that the inclusion of elephants in the festival fell under the category of "animal performance", and as a result, the elephants needed to be registered with the Animal Welfare Board. So far, the Board hasn't granted permission for the use of the elephants. On the morning of Holi, Rajasthan Tourism organizes a special celebration for visitors. It's held on the lawns of its Khasa Kothi hotel, near the railway station on MI Road (you don't need to be a hotel guest to take part). There aren't any elephants at the event but it features local Rajasthani folk music and the throwing of colors. Diggi Palace in Jaipur also hosts a popular Holi celebration. It includes a lunch buffet and cultural performances, as well as the throwing of colors of course. Vedic Walks conducts a special Holi walking tour. If you do want to attend a local Holi celebration with elephants, try the Eleholi Fest. Eleholi is a special event that's held every Holi at Eleday elephant park near Amber Fort in Jaipur. Two different programs are available, offering varying degrees of involvement with the elephants. Holi Festival: Tickets include five bags of colored powder, water, snacks, elephant feeding and photography, music, rain dance, Indian food, and Indian games. Expect to pay 1,500 rupees per person. Holi with Elephants: In addition to what's provided above, tickets include a range of elephant activities (riding, painting with organic colors, washing, and feeding), and bhang lassi. Expect to pay 4,000 rupees per person. Eleday was established in 2011 by Pushpendra Shekhawat, who quit his profession to pursue his dream of owning an elephant park and looking after the creatures that he so loves. His park now has 30 female elephants, many of which were rescued. The mahouts (elephant riders) have five generations worth of experience with elephants, including previously working for the royal family. There are a number of elephant parks in Jaipur. Many people are worried about how the elephants are treated there. The reality is that the elephants are used to carry tourists up to Amber Fort. This helps generate income for their upkeep (it's expensive to feed an elephant!). However, Eleday is known to be one of the parks that takes proper care of its elephants and treats them humanely. They're not harmed in any way and seem happy and well nurtured.